PT Pertamina Internasional Eksplorasi dan Produksi - PIEP or most commonly known as Pertamina International EP is a rapid growing oil and gas company in Indonesia with international work area. Pertamina International EP is a part of PT Pertamina (Persero), the national oil company of Indonesia. According to Pertamina International EP's company profile as cited by JobsCDC.com, PT Pertamina Internasional Eksplorasi dan Produksi was established on 18 November 2013 based on the need for an international asset management that is focused on the management of the overseas assets of PT Pertamina (Persero). 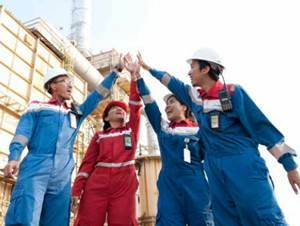 Based in Jakarta, Pertamina International EP now has 3 overseas assets; Asset Algeria (PT Pertamina Algeria), Asset Malaysia (PT Pertamina Malaysia Eksplorasi Produksi) and Asset Iraq (PT Pertamina Irak Eksplorasi Produksi). Have a good integrity, leadership, and interpersonal skills. Have a good understanding of knowledge of materials and services, tendering; budgeting, AFE; cost control and tracking generally needed. Have a good understanding of procurement process in Oil and Gas, logistic and scheduling. Required experience for minimum 10 years in operations support and OPEX budget management and minimum 3-years in management position. Have a good knowledge of SAP software (ERP) for Procurement is preferred. Have a good knowledge of MS Project or Primavera. JobsCDC.com now available on android device. Download now on Google Play here. Please be aware of recruitment fraud. The entire stage of this selection process is free of charge. Pertamina International EP - Drilling Operation Support Leader Pertamina Group November 2017 will never ask for fees or upfront payments for any purposes during the recruitment process such as transportation and accommodation.